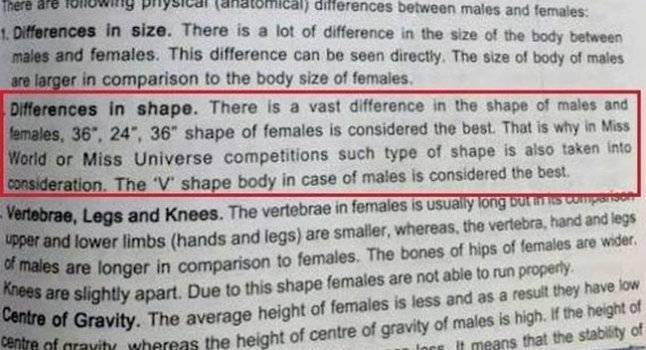 On April12, social media went viral with an image of physical education class 12 textbook suggesting '36'-'24'-'36' is the best figure for females. The Central Board of Secondary Education (CBSE) on Saturday has filed an FIR against the publisher under Section 6 (indecent representation of women (Prohibition) Act 1986). CBSE issued an official statement day after the news stating, "CBSE does not recommend books by any private publishers to the affiliate schools. Rule 15.1 (d) of the Affiliation-bye-laws of the Board clearly states that the school will follow the syllabus on the basis of curriculum prescribed by NCERT/CBSE and textbooks published by NCERT or CBSE as far as practicable." In the process, the publisher has caused wrongful loss of reputation, goodwill and credibility of CBSE. The book is designed to promote health and fitness amongst youth. The Board neither subscribes nor encourages irrelevant, sexist or derogatory references to any gender specially women.